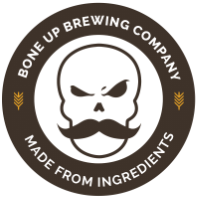 Stats: Gnasher - Bone Up Brewing Co. Cheese Pairing: Bright orange "New York Style" cheddar. A big ol' block of it. Food Pairing: A loaf of bread that's been hollowed out and filled with butter. Best Occasion to Drink: While playing "let's see what happens when we throw this off the roof"
Brewers' Notes: What's a grisette? The short-but-oversimplified answer is: a session-strength, somewhat hoppier saison. * So why not just call it a "session saison" and be on our merry way? Well, we think it's neat to try and bring back olde-skool beer styles that are on the brink of being forgotten (much like saison itself was at one point. And witbier. And steam beer, though that's a style we haven't dabbled in just yet), but mostly we just like saying "grisette." Plus, this is something that fits pretty firmly in our brewing and/or drinking wheelhouse: nice and easy drinkin' with a healthy but not overpowering dose of hops - perfect to put back in quantity at the end of a long hard day! *There doesn't seem to be a ton of reliable information on the style itself - there's a lot of vague speculation (short answer: much like saisons were made to slake the thirst of farm workers, grisettes were a miner's tipple), with a dash or two of needless pedantry (which we largely ignored, as one should), but that ain't faze us! It's not like we're rigid in adhering to style guidelines anyway, so we took the general gist and ran with it!